Reinplus Van Woerden, a Dutch bunkering firm also active in Germany, a 1994 merger between Reinplus Bunker GmbH (Wiesbaden, Germany) and Rotterdam-based companies Petroplus Marine BV and Van Woerden BV. The predecessor was Van Woerden (NL) but of course there was Reinplus Bunker (DE) as well. Although information is hard to come by numerous flags may be found. A first one is shown in "Flaggen auf dem Rhein" (1952 ed.) as belonging to Tankdienst (i.e. tanker service)T. Rein, Wiesbaden. White field (image with black holding line) with four blue horizontal and wavy stripes in the centre bearing white name "REIN" (presumably a family name ? and wavy as well), above it in a semi-circular bow "BUNKERSTATION" and below it, in a similar bow, "SCHIERSTEIN"? (names in blue). Schierstein is Wiesbaden's port on the Rhine (merged, 1926). A drawing of a Rein pennant may be seen on this 'Binnenvaart' page presenting inland tanker 'Petroplus 2', formerly 'Tina Rein': image from the Binnenvaart flag page, the caption is Rein Tankdienst GmbH Wiesbaden. The logo is placed near the hoist and the waves are still there but now rendered in red with white name "REIN" quite large; a black circle encloses most of it and insite the rim are the words, in black, "BUNKERSTATION" (top) and "TANKDIENST" (bottom). Please disregard the salmon background! 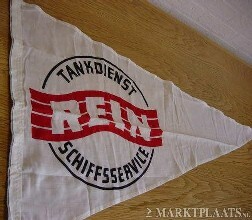 This variant pennant bears black words "TANKDIENST" (top) and "SCHIFFSSERVICE" (i.e. ship service; bottom) as can be seen above; also, the black circle is actually interrupted by the wavy brand. Found on Dutch auction site ?Marktplaats? as no. 182395774 (accessed 21 Jul 2008) put up by ?Skipvlag? of Maastricht, dimensions given as 0.45 m x 1.00 m.
Another pennant: white, with the logo in red i.e. four waves bearing wavy company name ?REIN?, frozen in time: see above. Source: German eBay offer no. 190184427738 (end 22 Dec 2007) put up by ?ramos_de?. Pennant said to be unused (?old logo? ); appreciative remark about the demise of the company; dimensions given as 60 cm x 118 cm. Yet another Rein pennant, white, with the four red waves bearing the wavy company name "REIN" in white, as seen in above. This one differs from the preceding item in having red flames issuing from the hoist, thereby shifting the logo towards the fly. Source: German eBay offer no. 190184427750 (end 22 Dec 2007) put up by 'ramos_de'. Pennant said to be new and unused ('old logo') and to be an absolute rarity as the firm no longer exists. Dimensions given as 59 cm x 117 cm. Source: German eBay offer no. 220078550050 (end 11 Feb 2007), put up by 'ohndangdang', dimensions given as 16 cm x 26 cm. Apart from the very first flag all items in this series are red-on-white and every one of them shows the waves with the company name in white. The present Reinplus Van Woerden flag does recall, modestly, those elements.